The soup’s on in Quincy: Pho Pasteur opened just before the new year and is serving lunch and dinner nightly. It’s the second location for the longstanding Chinatown original, family-operated since 1991. 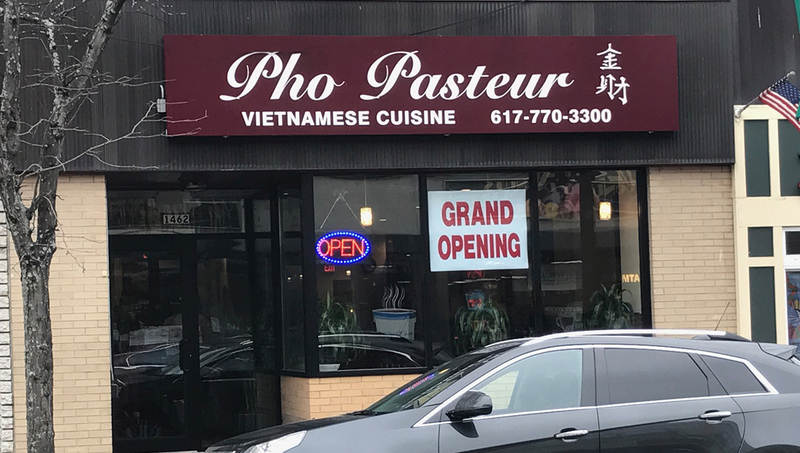 Like its sibling spot, Pho Pasteur Quincy has a lengthy menu of Vietnamese pho (noodle soups), com dia (rice plates), bùn (vermicelli noodle bowls), lo mein, seafood entrées, and more, as well as appetizers, like bánh xèo (savory pancakes) and chao tôm (shrimp cakes), salads, vegetarian options, and more. As Eater Boston noted in the fall, the Quincy location was allotted one of 23 new liquor licenses in the city, and offers a full bar alongside a handful of beers, wines, and sake. Like the Chinatown location, it also has fruit smoothies, salty Vietnamese-style sodas and iced teas, Vietnamese coffee drinks, and more. Pho Pasteur is open daily from 10 a.m.-10 p.m. for dine-in or takeout (though not for online ordering at the moment). It joins a brand new outpost of the South Shore mini-chain KKatie’s Burger Bar on a burgeoning block in Quincy Center. The developing area will also be home to the newest Fuji, slated for a January 10 opening; and other new dining options including Belfry Hall from the Townshend team; Zef Cicchetti and Raw Bar, from the people behind Alba; a new gelateria, and more. Pho Pasteur, now open at 1462 Hancock St., Quincy, 617-770-3300, phopasteurquincy.com; 682 Washington St., Chinatown, Boston, 617-482-7467, phopasteurboston.net.